Numerous fitness trackers exist, but not all have what it takes to provide the data and accuracy you need while on your fitness journey. 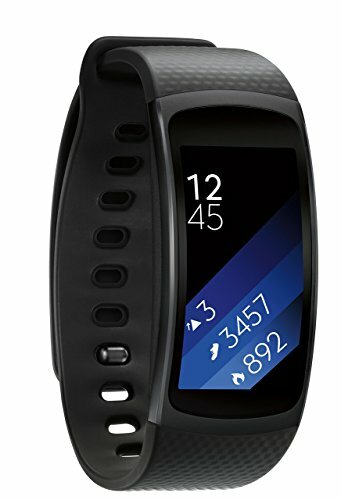 The Samsung Gear Fit2 handles a variety of needs, from auto tracking movements to mapping activity with GPS. Track your steps, calories burned, sleep quality, and even your heart rate all with this device. With so many options to choose from, it’s best to stick with one with a popular name and a slew of features you know you’ll love. With a curved display that fits nicely along the wrist, the Samsung Gear Fit2 is designed with practicality in mind. The GPS sports band offers GPS tracking with real-time stats, auto-activity tracking, instant notifications, and a built-in music player that allows users to access their phone playlist and hear the music while they walk or run. Bluetooth headphones are needed for this setting. You can pair your own since the device does not come with any. Most options work well with the tracker. The original Samsung Gear Fit was not far off in style from the Fit2, yet some changes did get made to make it more worthwhile. The updated version has a slightly smaller screen size at 1.5 inches compared to the original 1.84 inches. While users tend to like a bigger screen size, the small change to the second version is better for the watch since it makes it fit more comfortably on the wrist. Its sleek design is why the change was made in the first place. It has slightly improved screen resolution at 216 pixels by 432 pixels. Five days of battery life are offered as well, one day longer than the original device provided. With only a power button and menu button to worry about, you don’t have to remember which option goes to which like with the devices that have multiple things to push along the sides of the watch. Pair the device to your the appropriate app to get started and then the watch will allow you to go through the setup options. You swipe left, right, up, or down on the screen to use it, and push the top side button to go back. In the box you will find the gear fit 2 device already settled into the band. It does not come separate like some other options do. You also receive a charging dock and cord that allows you to charge your watch easily by plugging it into any compatible USB device, such as your computer. The included manual will help you set up the gear fit with ease. Simply follow along with the instructions to ensure the accuracy of the device and settings you desire. The convenient charging cradle makes charging simple. Rather than plugging in a cord and hooking your device to the wall, you simply place the watch in the cradle and connect it to your computer. The holder keeps the watch in place so you know it’s held up well and it can rest safely rather than being placed on the floor or elsewhere. The short cord ensures nothing gets tangled up and you can continue to charge your tracker with ease time after time. Tracks steps, calories, heart rate, and sleep quality. Available in black, pink, or blue. It has built-in GPS for accurate tracking. Sensors sometimes differ from watch to watch. Uses an interlocking band instead of a buckle that could be more secure. Must turn off GPS and other settings or the battery will drain quicker than expected. Many fitness trackers on the market have become bogged down with features that seem difficult to understand. You may end up spending more time figuring out the device you’re using than getting any exercise time in for the day. The Samsung – gear Fit2 has easy-to-use options that make it easy to set up and continue to use – no more fumbling with features for hours. Use the provided manual to get everything set up properly before you attempt to use it while completing an activity. Doing so will ensure things work correctly before the first use so you don’t have to struggle when it’s needed. The built-in GPS allows you to track your movements and map your activity with accuracy. You can look back at the map to see where you’ve been and use the data for setting a routine. The auto tracking feature also ensures every move you make gets recorded in the data. You don’t have to worry about pushing a button first to make it happen. Receiving notifications to your tracker? You can respond as well with the Gear Fit2. No more needing other devices on hand when you’re out and about. You can receive texts and calls to the smartwatch and respond right from your wrist. Calendar notifications come to your device as well. Look right at your wrist and see when your next appointment will be or who you have to take to practice next. You never have to take your phone out of your pocket to get the alerts for upcoming events you have to attend. The find my phone feature is another to boast about, with users able to find their devices with a push of a button. Both the original version and the Fit2 have this capability. If you’re wearing this watch and your cell phone gets lost, you can use the feature to find it and get it back in your hands in no time. It’s a handy feature to have that many other trackers do not possess. Although it’s water resistant, the gear fit2 isn’t intended for use in the water. You’ll have to count your laps with another device. However, you can use the gadget to track your workout on the elliptical, while you run, cycle, and perform other tasks on land. The tracking sensors work carefully to determine which activity you’re completing so you get accurate stat readings. If the device does not automatically detect the exercise you’re doing, you can set it yourself so you receive proper monitoring. Select your sport like yoga or rowing and the gadget will better be able to detect your movements and record your activity so it’s accurate. Your heart rate, calories burned, and other information will only match up precisely if you set the device correctly before use. Use the built-in GPS to map your run with accuracy. It will track where you go so you can pull it up later on your app to see your running patterns and where you’ve been. It helps you prepare for another run in the future so you know how best to handle it, or find other routes so you can try something different. Looking to listen to music while you work out or jog? This device allows you to connect your own set of Bluetooth headphones so you can listen with ease. You can store some of your favorite songs on the device itself, or simply connect to your Spotify account to gain access to thousands of songs and numerous music categories. The water-resistant design holds up in any condition. Whether the wind is blowing hard or the rain is pouring down, you can rest assured your device will hold up well. Sweat while you run or complete your activities is no match for this fitness tracker thanks to the water resistance it provides. The S Health app is what you should be using with this device. It ensures you receive insightful information based on the data it’s computed. Set goals, check the leaderboards to see how others with the app are doing compared to you, and even set challenges for yourself and others. With a simple touch of a button you can share workout results to the app so others can see the progress you’re making and you can view it for yourself later. Auto-Tracking – The auto-tracking feature ensures all moves you make get recorded. It tries to pinpoint which exercise or activity you’re completing so it can tailor the reading to match what you’re doing. Multiple options are available on the device, or you can set your own sport or activity to truly receive accurate data. Music Storage – You can store music right from your tracker, or get into your Spotify account to access millions of songs. You’ll have to pair your own headphones with the device, though, to be able to listen to any of it. Many brands of Bluetooth headphones work with the gear fit2. Compatible With Multiple Devices – Just because it’s a Samsung brand doesn’t mean this tracker isn’t compatible with other options. It’s compatible with multiple devices from both Android and Apple. Connect to Android or iOS phones that are able to access the app. Charging Cradle – Most trackers come with a charging cord only. This device comes with a charging cradle that the watch can lock into easily. Simply plug the cradle cord into a USB-compatible device, like a computer, and set the watch in the holder to allow it to charge. AMOLED Screen – The AMOLED screen provides a high quality picture display so you can easily see and read your notification texts and data. The full-color curved screen has a tall display so all data is easy to read, yet it fits nicely on your wrist thanks to the smaller width. You want to know if you’re getting a good deal before you buy anything, so be sure to check out the gear fit2 review to see what customers are saying about the product. While not everyone loves the device, the majority of consumers boast about its usability, durability, and design. The tracking features do exactly what they say and offer insightful information that makes fitness tracking beneficial in the long run. Users rank the Samsung Gear Fit2 as one of the best fitness trackers on the market thanks to its features, functionality, and level of comfort. The band rests comfortably on the wrist and does not interfere with day-to-day activities. The features come in handy when trying to set the right readings for a workout, while the functionality ensures ease-of-use. You can use the device to look at how you did not only for that day but the past week as well. Having this much information helps you better gear your workouts toward your fitness goals and needs. Customer reviews for the fit2 remain positive overall, but some negative thoughts have made their way into the fold. Some people say the battery life is not as long as they’d like. Turning off certain features and avoiding using the device at all hours of the day will help prolong the battery so you don’t have to recharge as often. Because the tracker comes with a charging port, it’s also easy to quickly charge it up for a bit before you have to put it back on the next time. While a few customers have critiqued the battery life, the overall review on this device remains positive. Customers are generally happy with their purchase and continue to recommend the gear fit2 to their friends and family. Most who give the device a try are pleased to have done so. The verdict is in for the Samsung gear fit2 smartwatch, and users overall enjoy the device. The extra features like the call and text receiver and response system help put it above others on the market. Track your steps, watch your calories burn away, and record your fitness goals all with this device. Its sleep design with curved display screen will look great on your wrist all while you complete the activities you enjoy. You can even store your favorite music to listen to or connect to your Spotify account when you’re ready.